Not really a landscape focus this one, but just something I’ve been musing over for a while. My eldest, Little Un, is currently awaiting a formal diagnosis of “high functioning” Autism Spectrum Disorder (ASD). As we struggle to fully understand the condition with all the knowledge and support networks, I’ve often wondered how such individuals were explained and understood in the past. I will flag now I’m still learning the correct terminology when talking about autism, so if I don’t get it quite right forgive me. Ironically, I’ve always called Little Un a changeling due to their inability to sleep as a child (the days I went to work on 1 hours sleep are more numerous than I can mention), and much of identification of autism in the past focuses on Changlings – mostly coming from Leask et al’s short report from 2005 . Julie Leask (who, at the time of writing her paper, was based at the National Centre for Immunisation Research and Surveillance of Vaccine Preventable Diseases in New South Wales, Australia) was looking into the unfounded allegation of a link between MMR and autism, and was one of the key researchers who linked Changling folklore to the condition. Changlings are left by fairies who had taken human babies back to their world. Often they are described as made of wood or clay (often associated in modern day medical terms as describing a Sudden Infant Death) or disfigured and unresponsive sickly fairy child. Folklore tells us that the fairies needed human children to maintain their existence; and in some stories, it is said that the fae are unable to have healthy (or even) children of their own. What is left in the human world is a half child, seemingly uncommunicative and lacking the ability to express emotion, given to unexplained crying, and often unable to speak. Leask et al describe how the children could seemingly change: “Some of the features of these stories, including the initial health and beauty of the human child, the change after some period of ‘‘normalcy’’, and the specific behaviours of the changeling … are well matched to symptoms in some presentations of autism”. I find the Changling story fascinating, and long before I had the personal interest thought its association with autism compelling. However, what is described above only goes a small way in explaining the types of children, who obviously grow up into adults, on the autistic spectrum. What about those, like Little Un, who are seemingly ‘normal’ on casual acquaintance, but can exhibit extreme changes in behaviour? One story keeps coming back to me, its a piece of English folklore relating to the man who took a fairy wife (I’ve also seen the same story in Scottish folklore told as a mermaid wife, and think it works just as well). In the story, the man, a respected farmer but long time bachelor, meets a beautiful girl, who turns out to be a fairy. Falling in love with her, he seeks advice on how to claim her as his wife. He was told that if he performs a ritual at midnight she will become human and he can marry her. However, the man is warned not to strike his wife more than three times otherwise she’ll return to her fairy state (sometimes these old stories are hard on our modern standards of what would constitute too many times to hit your wife…. But still). The farmer laughed and said he could see no reason why he would need to control his wife in such a way and carries out the ritual. Sure enough, the next day the former fairy arrives at his farm and they are swiftly married. All was okay at first, but soon the farmer noticed his new bride would be distant and unresponsive, she would be prone violent outbursts and foul language, which would come on without warning, and meant that on three occasions he had to strike her to bring her to her senses. The respected gentleman also found his new wife embarrassing in public, often speaking out of turn to strangers, or ignoring them completely. Things finally came to a head as the couple attended a funeral and the girl laughed uncontrollably. Angered and embarrassed the man struck his wife a forth, and final time. She returned back to her kind and he was alone again. This story echoes a number of the ‘symptoms’ often associated with conditions on the autistic spectrum like Asperger’s. I’m wondering if such stories that describe such interactions with fairies, merpeople and the like are describing such things. These are just the muddled thoughts of a tired mum trying to make sense it all, but there could be something in these stories that give clues to how the condition was explained in the past; when the Changling grows up and tries to fit into the world. Leask, J, Leask, A, Silove, N. 2005 Evidence for autism in folklore? Arch Dis Child; 90: 271. There are some lovely clumps of wild flowers at work at the minute, but one of my absolute favourites are daisies. By nice coincidence they are attached to so much folklory stuff. Who hasn’t carried out their own divination and counted the petals of a ‘measure of love’ flower (and who hasn’t fixed the result!). Nicholas Culpeper talks about the healing properties of the daisy, particularly for inflammation. During the medieval period the crushed flower were thought to aid wounds and help healing. 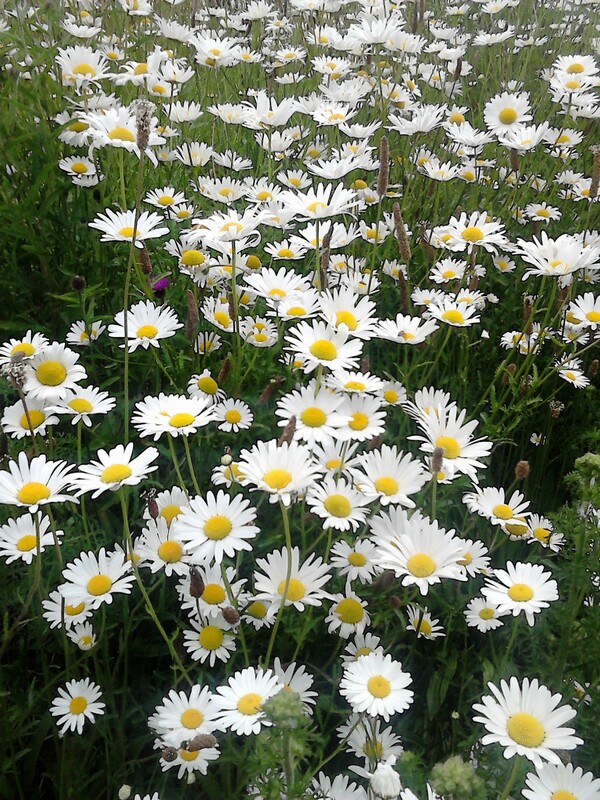 Daisies were also thought to aid “women’s problems”, and in Wales during the Middle Ages it was used to treat madness, small pox and tumours. Daisies were also used as protection – children dressed with daisy chains could not be stolen by fairies. The church in the village where I live is chiming the hour at 10 past, which confused me greatly. My normal explanation for such things is that “it’s the pixies” – in this case because they dislike bells. This got me thinking, how do you protect yourself from the malevolence of pixies and fairies, and avoid being enchanted or led astray on the walk home? 2. Put a pin in your clothes. Pixies and fairies are repelled by iron (both in ore and worked form), so this seems to be the lightest way of carrying some on your person. 5. Holy water. Often thought of as fallen angels (not good enough for heaven, not bad enough for hell), holy water is said to make the fairies and pixies keep their distance. A soggy solution, but effective. 7. Don’t travel on your own. Or at night, or in a storm, or mist. In fact best to stay in all together. 8. Don’t ignore them. In some places it pays to be polite – like at Santon in the Isle of Man. Always best to say “Laa Mie” (or hello if you not versed in Manx) as you cross the bridge. 9. But if you see one, don’t let on… Remember the tale of the mortal midwife who, after delivering a fairy child, secretly put drops in her eyes that allowed her to see the fae. On recognising the father at a fair she called out to him (and therefore showing him what she’d done), and he responded by taking her sight. 11. Best not to eat any food offered either. As you’ll be under an obligation you won’t be able to get away from; they always want something in return. 12. In fact, just don’t provoke them... Seriously, do you still think running widdershin around a fairy ring is a good idea?? I have been researching folklore and archaeology for about thirteen or so years. It’s becoming a little more mainstream now, but when I started I was known as “the girl that talks about fairies”…. I grant you, this isn’t the worst thing I could have been known for but it was, and still has been, a slight millstone around my neck. This is in greater parts down the fact that some people think I actually believe in fairies, or that I want to be one. As such, when discussing my research I spend a good part of my time explaining what I’m NOT talking about (the cutesy flower fairy image of the Tinkerbell variety). I also make it clear that fairies and pixies aren’t the same, and that there are real differences in where they occur in the landscape. One of my favourite stories to recall is the battle of the fairies and pixies on the Devon/Somerset border. I discovered the story while writing my PhD a number of years ago, but I still love it. There was a time when the fairies who dwelt in Somerset and the lands to the east of the River Parrett wanted to cross the border and enter Devon to settle and extend their territory. However, the Devonian pixies, who already lived there, refused them entry. Soon war began between the two beings, and it violently and terribly raged across the landscape. The final battle was fought on the Somerset side of the Blackdown Hills, a range of steep valleys and ridges that straddle the Devon/Somerset border well known to be the dwelling of pixies, spunkies, and ghosts of the Monmouth Men (a story for another time…). It is said that the precise spot is at the village Buckland Saint Mary that lies some 9 miles south of the county town of Taunton and near to the modern A303. During this final confrontation the fairy host were defeated and driven away back into Somerset and Dorset, and some further afield across the water into Ireland. They were never to return to Devon, or try and conquer the lands again. 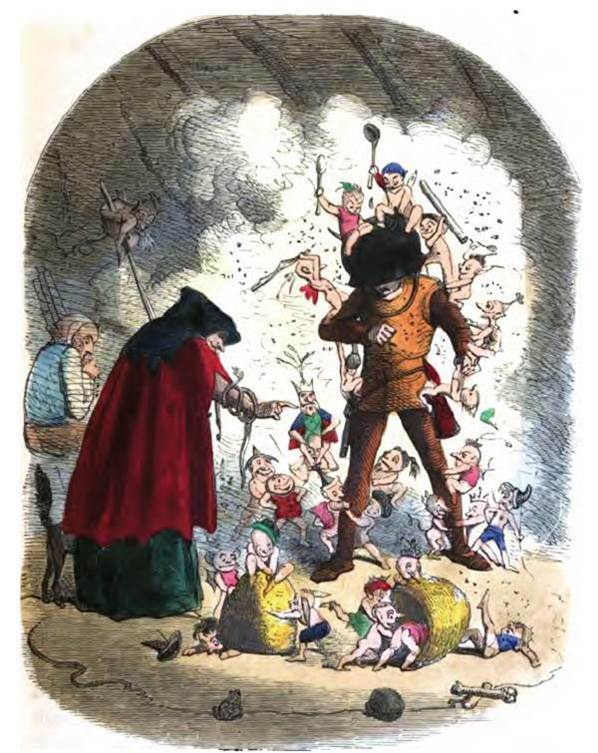 The wonderful Mrs Bray tells us that the king of the fairies was none other than Oberon, and it was during this battle “his majesty received a wound in the leg which proved incurable; none of the herbs in his dominions have hitherto had the least beneficial effects, though his principal secretary and attendant, Puck, has been in search of one of a healing nature ever since” (Bray, A. E. 1853, A Peep at the Pixies, or Legends of the West 11–12).